Second, there’s no guarantee that incomes would keep pace with higher inflation. The question is: were these inverse trend movements a coincidence, or have the developed economies only been able to achieve low inflation by suppressing wages and squeezing labour’s share of national income? 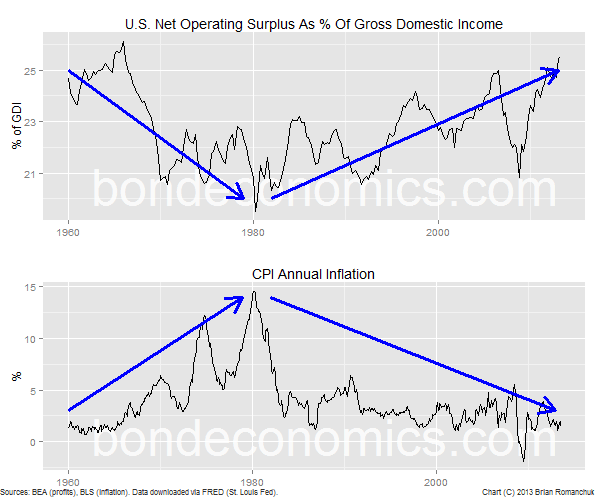 The political implications of this question will cause discomfort amongst central bankers, who argue that disinflation should be neutral for the distribution of income. They would presumably argue that this was a coincidence. However, my guess is that this was not a coincidence, and this provides a roadmap for possible ways in which the structure economy will evolve. The current situation is self-reinforcing. High corporate profits mean that income is being increasingly distributed towards those who have a low propensity to consume, helping create the undertow of weak demand that plagues the developed economies. The weak demand in turn keeps inflation and wage pressures at bay, locking the economy into structural sluggishness. It seems likely that it will take a powerful force to break this cycle. However, to return to Binyamin Appelbaum’s question, the historical relationship would indicate that wages will outpace inflation if the future rate of inflation is high. However, a mild inflation (returning to 3%, say) may not be enough for labour to recapture a larger share of national income. For further reading on this and similar subjects, I recommend the web site of Bill Mitchell, an Australian academic with an expertise in labour market economics. As a final note, the relationship above between inflation and profits casts some doubt over the view that equities provide an effective hedge against inflation. If the correlation holds, a significant rise in inflation would coincide with a falling profit share of GDP. The fact that the corporate piece of the pie is shrinking could swamp the effect of a growing pie, and so profits could be stagnant or even fall. Given the sensitivity of equity investors to earnings growth, falling profits plus higher discount rates could prove toxic for equity returns.